← I’m totally in love! I did NOT spend the WHOLE time holding the baby last week. Steve told me I HAD to let Katie and Adam hold him once in awhile. So, since I was forced to give the new parents a chance at holding my new grandson, I did sneak away to check out the nearby Goodwill store. 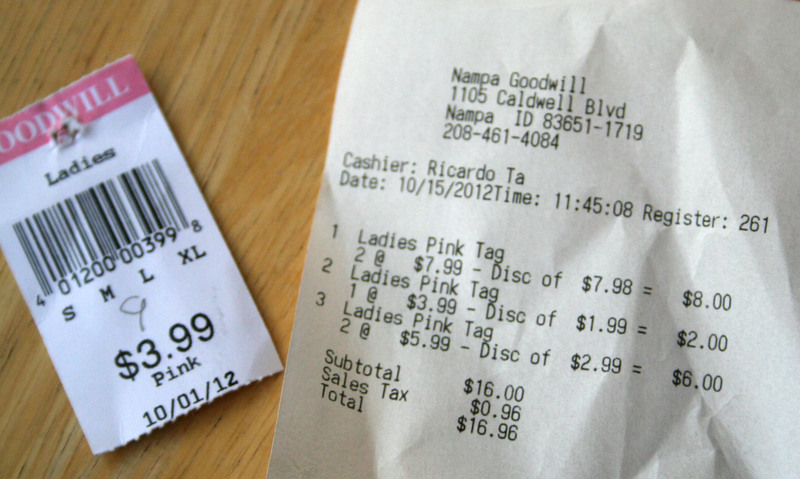 All the pink tags were half price so of course, being the cheapster that I am, and being spoiled by my local thrift store prices, I only looked at pink tag items. I found this cute dress for $2.00. All I had to do was take it in under the sleeves a bit, otherwise it was a perfect fit. I loved the color, pattern and the fun lacy detail on the front. But it IS fall and the days are getting cooler and I’m losing my nice summer tan, so I much prefer to wear sleeves to school. 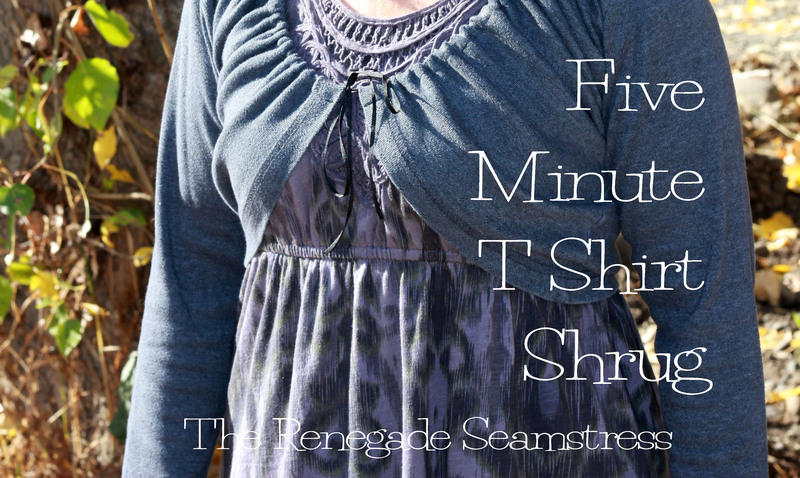 I thought it would be fun to make a long sleeved shrug from this gray thrift store t-shirt that I’ve had in my stash for quite awhile. First cut right up the middle of the shirt. 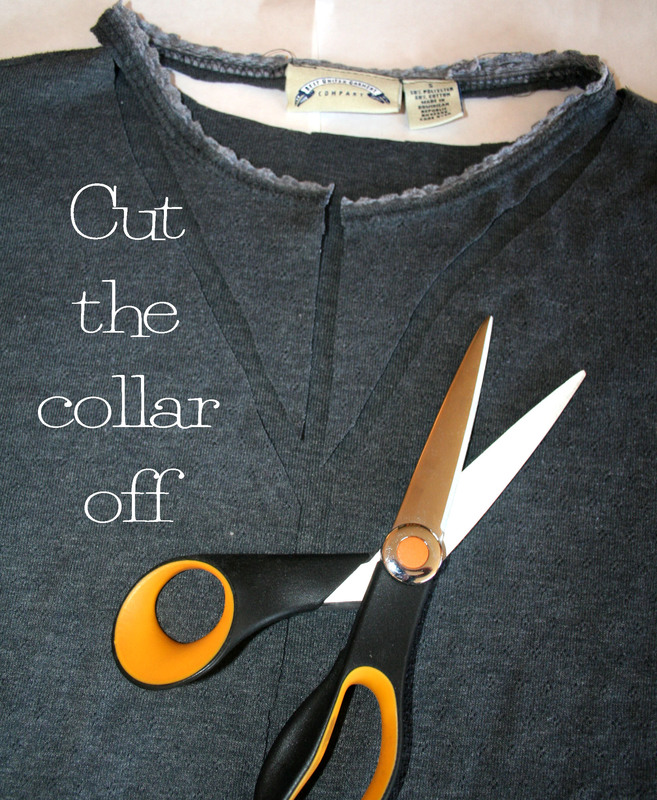 Then cut off the collar. 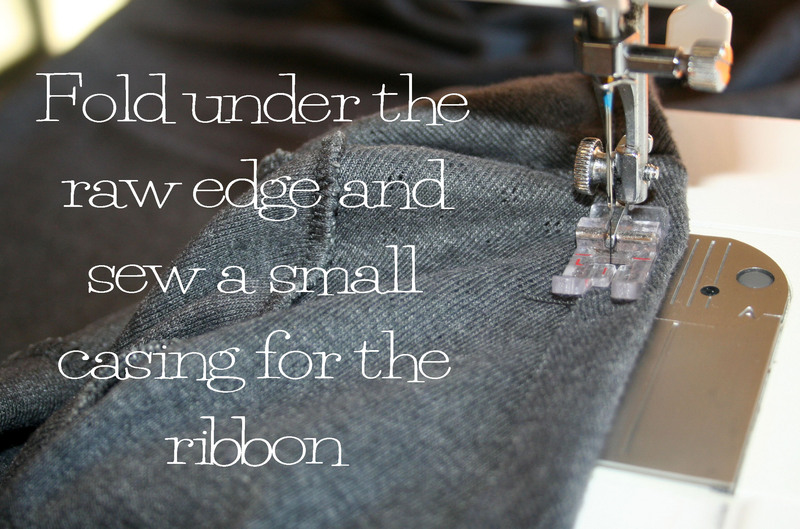 Fold under the raw edge and stitch to form a casing for the ribbon. 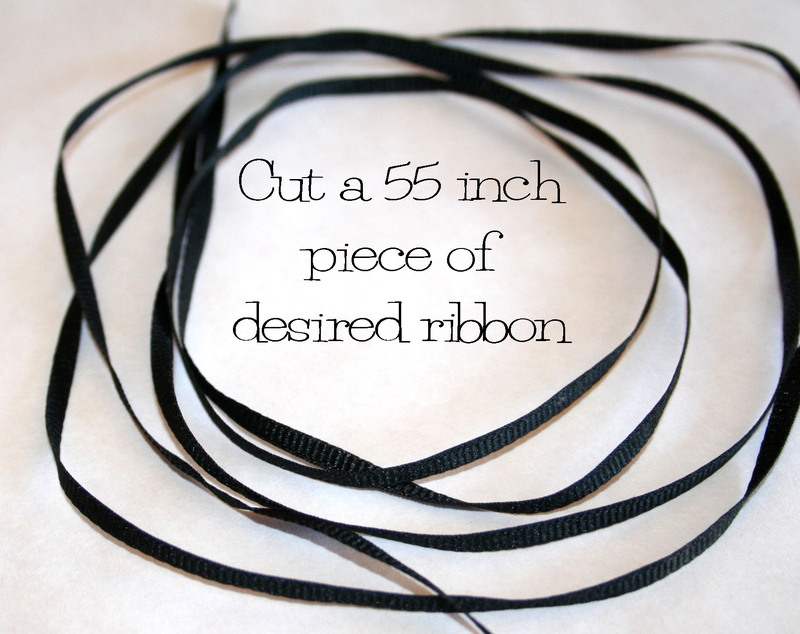 Cut a 55 inch piece of ribbon. 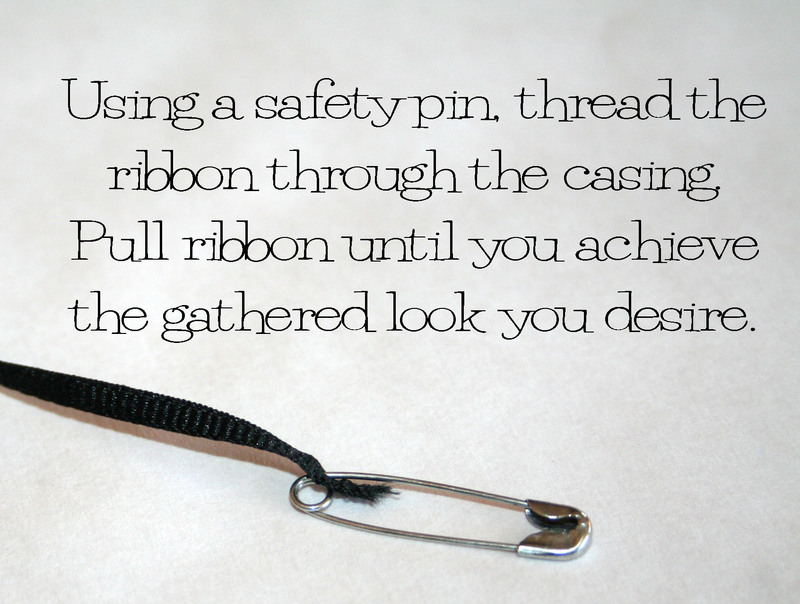 Thread it through the casing, using a safety pin. I can’t wait to wear my new dress to school this week. A big thank you to my good friend Kris! 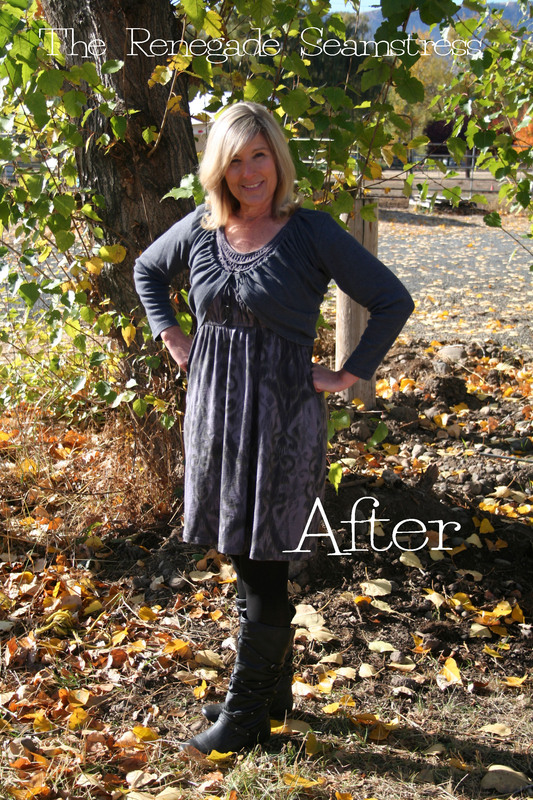 Not only did she give me her “old” Rebel XT Canon camera, when I started blogging, but since my “fashion photographer” was turkey hunting today, Kris took the after pictures. Her generosity and genuine ways, never cease to amaze me. I love you, Kris! 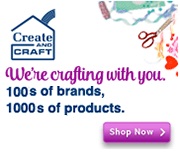 This entry was posted in Uncategorized and tagged crafts, DIY, family, fashion, photography, recycling, Refashion, Sewing, Thrifting, upcycling. Bookmark the permalink. Thanks, Janette! I’m working on refashioning another Goodwill find right now. There were some great bargains that day! Hi! Thanks so much for the tutorial. I really needed this one! Your make it look super easy. I’m not very experienced and appreciate simplicity. I’m so glad it was helpful for you! Thanks! It takes longer to find a t shirt than to actually make it. 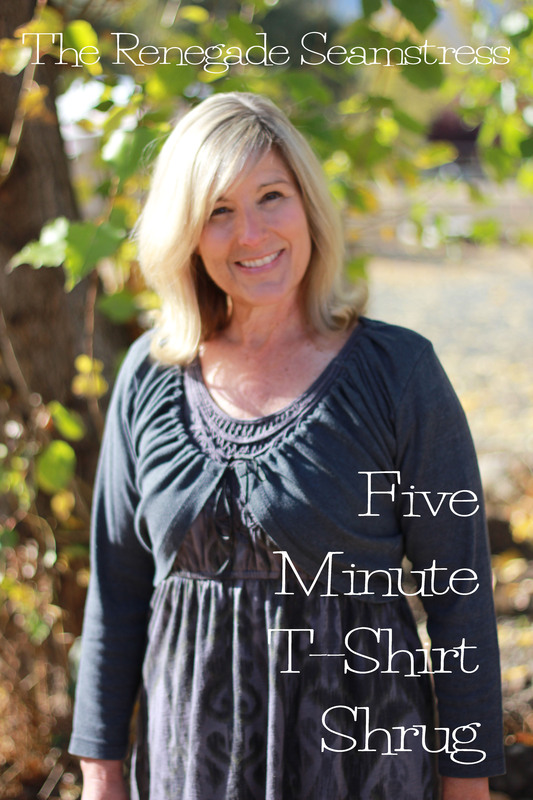 It’s a great way to wear short sleeved clothes during the cold months. Beth, I had to try this, and luckily, I had a red, long sleeve t-shirt in the give away pile. I love the way it turned out! Thanks for the tutorial. Wow, Amy! That was fast! It’s such a quick and easy way to add to an outfit. I’d love to see a picture of yours. Fantastic idea! Have several I rarely wear. Thanks for this excellent idea. One of your best. You keep getting better and better! I like it :). Maybe I’ll add it to my to-try list. The last project I tried did not turn out so well, but that’s all on me. I clearly did something wrong with the bleach pen. 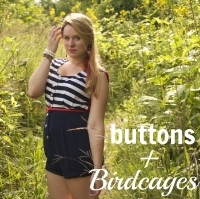 It’s the perfect easy project to make a short sleeve outfit last a little longer into the colder months ahead. I hope you get a chance to try it. you look so great in that dress!!! and I HAVE made that refashion awhile ago! I think it’s the kind of shrug that looks good on anyone 🙂 but it does make you look lovely! Thank you so much! The dress was an awesome find in the Goodwill. I didn’t want to wait til the weather got warm to wear it. Hence, the shrug. I agree, it’s a flattering look for everyone! Ok, I know you are busy but after looking through my closet, I discovered some pieces I loved, but that simply don’t work. However, I don’t know how they might be refashioned. 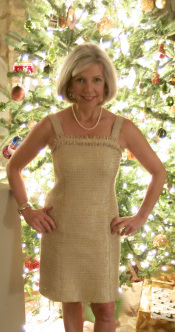 Think you could start a segment called, “Refashion My Fashion” where readers send in their troubled pieces for ideas? Oh, I LOVE that idea! Going to the thrift store and dreaming of ways to refashion things is one of my favorite things to do! It would be fun to suggest refashion ideas to others. I just might have to do this!!!!! I found this lovely sweater dress at Goodwill but the shoulders are U-G-L-Y! I’ll send you a pic. I still want it to be a dress but not sure how that can happen. That’s sounds good, do you have my email address? I have seen this techniques before but you made it look even easier! Thanks – can’t wait to try it! 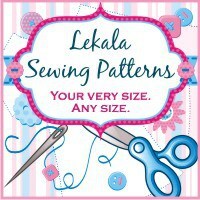 I enjoy your blog – you can visit me at http://LoveItSewMuch.blogspot.com. Thanks! Thanks Julie! It’s definitely not an original technique, but an easy lifesaver for this outfit! I’ll head over to your place for a visit. That cannot be that easy! This is so cute, as usual. Wait…what happened to the bottom of the shirt? did you trim that off? Yes, it really is that easy! 🙂 And nope, didn’t trim off the bottom. It just gets pulled up and around when you pull the ribbon tight. If you look closely, you can see the bottom hem. Thanks for all your comments. I really appreciate what you have to say. That is a great shrug! My daughter loves jackets and such things…this would be a good alternative. Thanks.It’s super easy and quick. You can make ANY color to go with any outfit. You look so dang cute and stylish in that outfit! And you never cease to inspire me. Thank you for sharing your creativity. Thanks so much! 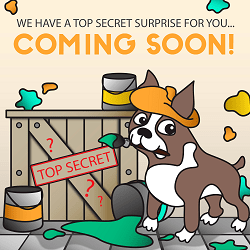 I can’t wait to see what you make next! My favorite look of yours. Too dang cute! This post is such a great inspiration for us all to repurpose a tired old T. Thanks for taking the time to post it. I’m a writer, photographer, co-founder of Trashbackwards.com and we’d love to reblog this post, with your permission of course and proper credit and attribution. We haven’t tried the WordPress “Reblog” button yet and this post would fit in perfect with our content which is about reusing what we already have before buying new. We’re developing a web and mobile app to help people get closer to producing zero waste. With your permission, we’d love to reblog your T-into-shrug post. It’s very nice to meet you. 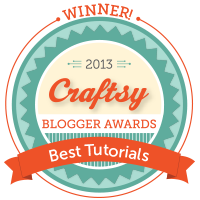 I enjoyed taking a peek at your blogs and I appreciate your message! By all means, feel free to reblog the post, I’d be honored to be a small part of your mission. Oh isn’t that fun! My daughter lives there now so when we go to visit, I usually make a stop at the Goodwill, then head next door to the Idaho Youth Ranch and over to the DI. 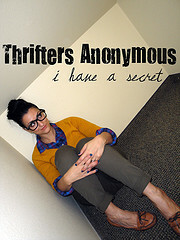 All wonderful thrift stores! 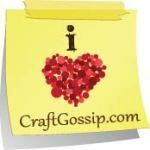 I’ve discovered you a few weeks ago & have enjoyed looking at all of the creative things you’ve done. I love this shrug & can just see my little granddaughters wearing them, especially the one who fancies herself a princess! I think it would look cute to sew lace or some other trim across the bottom hem after you cut the shirt in half. I love the idea of putting lace across the bottom. I hope you’ll send me pictures when you make it. I’d love to see your creation! I’m glad it worked for you. So easy, I want to make one in every color….. I love you! lol!! All your tutorials are just so amazing and inspiring. I’m going to head out tomorrow to find a long sleeved white shirt. I think I’m going to make it 2/3 sleeved since its still summer. A/C gets chilly! Thank you, Emily. Good luck with your shrug, I love mine and wear it all the time. As a matter of fact, you’ve inspired me to make a few more. 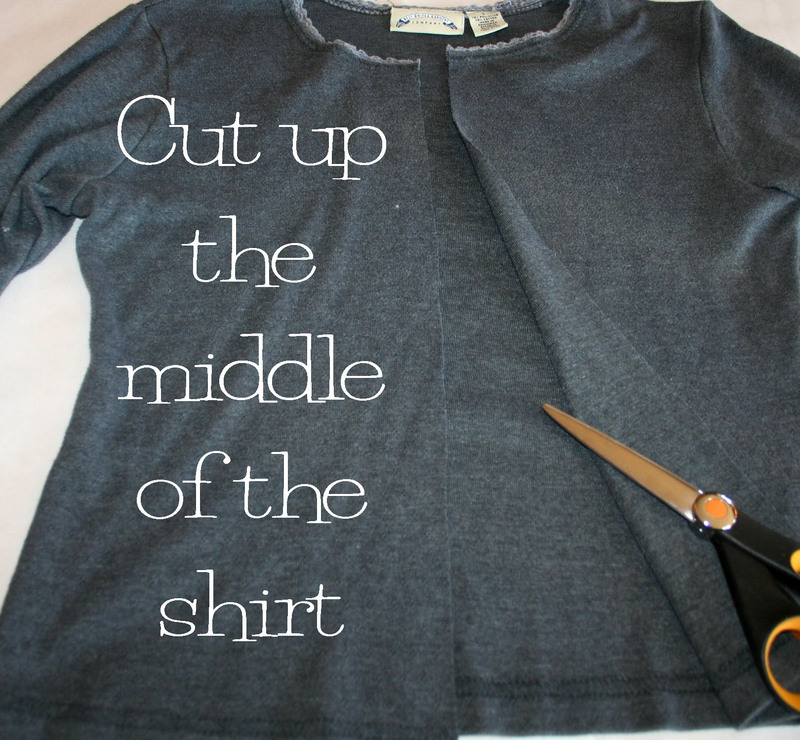 Pingback: Grandmother Wren » Blog Archive » Back to School Tee Shirts – DIY! You don’t need to do anything to the bottom of the shirt.When you create the casing down the front and around the neck, slide in a ribbon, and pull the ribbon tight, the bottom of the shirt will just come up and create the curve. I’m wondering you must have cut more on the lower edge/bottom of the t shirt and sewn a finished edge for it to look like it does when completed. Am I correct in thinking this? I left the hem of the t shirt intact. The hem ends up being the edge that you see. Let me know if you have any other questions. 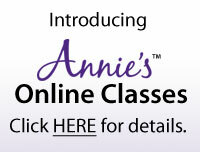 Hi Beth, I just found your blog the other day and am LOVING it all the way from Sydney!!! 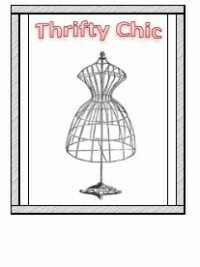 Your photos are amazing, your tricks are simple and I have already made 2 of these shrugs, a bleach pen shirt, cut a few dresses in half and refashioned them, and many other things from your blog. My partner thinks I have a problem…. haha. I have a question and a suggestion though, question first: when you make these shrugs I find it hard to sew straight to create the casing and end up with “bubbles” at the shoulder areas, which is not a huge problem as its bunching anyway but I would love to know how you created your beautiful finish. On to the suggestion, if you don’t have a bleach pen a cup of bleach and a thin paintbrush works well too!! 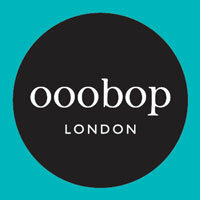 Loving everything you do and cant wait to see more and maybe send you some photos of what I’ve done too!!! Thanks for the lovely compliments and the tips, Tisa! Both are very appreciated! As far as the bubbles go, I haven’t had that problem so I’m not sure what advice to give you. 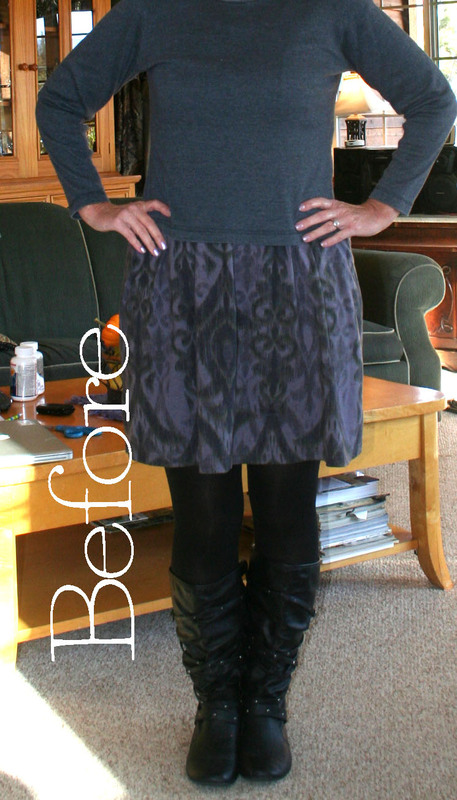 I love this refashion! 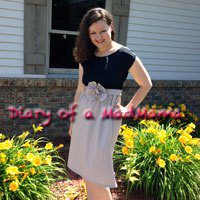 The only thing I found is that the length of the shirt is important – if it’s too long you end up with a large, droopy pouch of fabric in the back, depending on how tightly you draw up the ribbon. Being vertically challenged, t-shirts in plus sizes to fit me are always extra long and I didn’t take that into account when I made the first shrug, so it’s more like a cocoon wrap, but I still love it. The next one will get a hem too, and since the casing has to be sewn that certainly isn’t a big deal. Now I don’t have to give up my favorite short sleeve tops in winter, and I don’t have to freeze in the office in summer either!